We are no strangers to helping clients understand and select suitable website metrics, often called key performance indicators (KPIs), to measure the effectiveness of a marketing effort. The first step is to have a clear understanding of your goals and tactical executions. Once this is accomplished, you can develop the primary KPIs as well as the supporting metrics that let you assess the health and success of your website. These web metrics detail engagement, retention, loyalty and most importantly, what's referred to as conversions. Conversions are predetermined actions deemed desirable to your company based on your site’s capabilities. The most classic example of a conversion is completing a purchase if your site allows for e-commerce activity, but other actions, such as downloading a whitepaper or submitting a form, can also be classified as conversions. Let’s assume the purpose of your website is to drive sales leads. 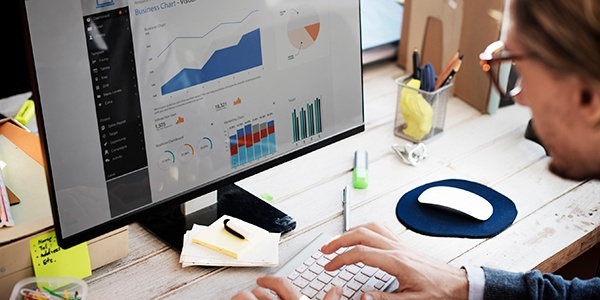 To measure how well your site is doing, you’ll want to analyze these common metrics to determine website performance and the efforts you’re using to drive traffic there. Direct traffic – the visits that come from a user typing your url directly into their browser’s address bar. Organic search traffic – the visits that come as a result of a search query a user has made through search engines such as Google or Yahoo!. Referral traffic – the visits that come because your site was mentioned and hyperlinked on another site or blog. All of these are important but they might be associated with varying levels of conversion, so you should calculate how much each traffic source is converting. This allows you to make adjustments based on the source proven to be most effective for you. Unique Visitor Conversion. In most cases, the way a first-time visitor interacts with your site is quite different from how a returning visitor will interact with it. To improve first-time visitors’ conversions, (like downloads, subscriptions, purchases, etc.) it is helpful to analyze them separately from the conversion rates of returning visitors or pre-established customers. Looking through the lens of the new visitor and determining what they first see when they arrive on your site will show you where improvements in user experience need to be made. Site usability goes a long way toward reducing bounce rates - the number of visitors who come to your site and immediately leave - for new visitors. Return Visitor Conversion. There are two critical considerations within this metric. The first of these is understanding the reason for a visitor’s return and the second is identifying whether the visitor converted on their first visit. If they did not, it is important to learn why not and how you can convert them on their second visit. On a positive note, even if someone didn’t convert as a new visitor, your site interested them enough that they chose to return. Now that they like you, you can analyze their onsite behavior and use what you’ve learned to figure out how to increase your return visitor conversion rate. Interactions Per Visit. Even if your visitors don’t convert, monitoring their behavior on your site, in terms of how they interact, is important. There are a number of sub-metrics that you can check to analyze this. For example, what are the page view rates (or number of pages each new visitor views) per session for unique visitors? How much time do visitors spend on each page, and which pages garner the highest traffic? Each interaction is an important consideration, the goal being not only to increase overall interactions, but also to determine the most effective way to leverage these interactions into visitor conversions. Cost Per Conversion. One of the most important metrics to consider is your cost per conversion. It doesn’t matter that you have high conversion rates and high value per visit, if your cost per conversion is so high that it reduces your net income to zero or even results in a loss. While trying to increase conversion, keep your costs per conversion and overall margins in mind. This will allow you to ensure an appropriate threshold for cost per conversion. Bounce Rate. The bounce rate is the rate at which new visitors visit a page on your site and immediately click away without doing anything. You don’t want high bounce rates, because they indicate the visitors spent very little time on the site and had no interactions with it. Most of the time, your goal is to minimize your visitor bounce rate. However there are a variety of explanations for high bounce rates, and it’s important to understand why they’re occurring. Perhaps it’s high because you’re using weak or irrelevant sources of traffic. Or maybe your landing pages haven’t been properly optimized for visitor conversions, in terms of, say, how long it takes for the pages to load, or for their ease of use. On the other hand, high bounce rates might also indicate high usability. Here, you’ll want to examine the bounce rates for individual pages, as it is possible the visitor immediately found what he or she was seeking (like a whitepaper or an article) and then left because the task was completed. Exit Pages. Exit pages will tell you where visitors are on your site when they leave. In many cases, your final call to action (CTA) or conversion may occur multiple pages into the process. To maximize conversions, it is wise to examine your exits and uncover the stage in the process during which your visitors are exiting the site or abandoning their shopping carts, if the site provides ecommerce features. Only then can the process be modified and optimized to better fit conversion. There are many website performance metrics you can use to determine which marketing efforts and platforms are doing the most for your business, and which are falling behind. Selecting those that are most closely aligned to your business goals will help ensure that you achieve them. Looking for more insight on website metrics that are worth tracking? We’ve revisited the topic and found more ways and in-depth info to help you measure site performance.